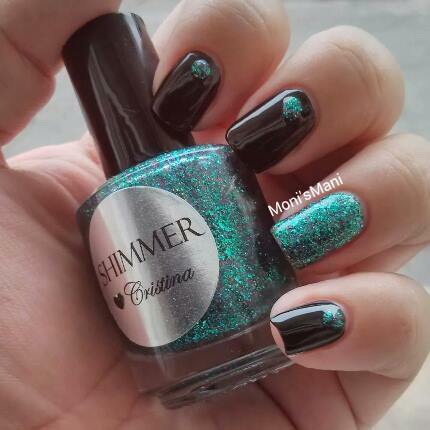 Today is day two of my Shimmer Polish reviews and I have Cristina for you! This is such a pretty color! I would say it’s a teal but it is made up of green, forest, teal, blue and pink glitters in different shapes (squares, circles, hex, dot). Here is a close up of the bottle plus swatches with one, two and three coats over a swatch stick. 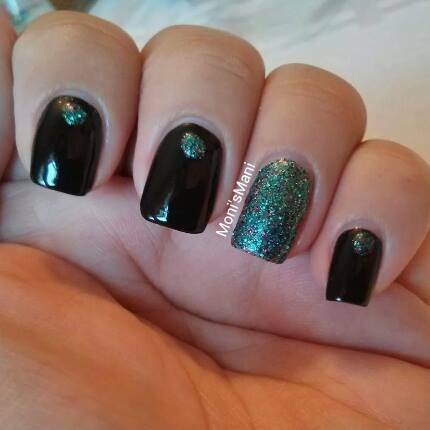 Again, the diversity of glitters in these polishes is amazing! And the combo makes such a pretty shade. This polish is absolutely beautiful and I thought it was perfect to combine with black. Hope you like it! What do you think? Hope you like it as much as I did! Que bonito es el esmalte que has usado que preciosidad de brillos que tiene..! Una manicura muy elegante Monica..! !